Greenpeace, a group of activist lobbying for more environmental friendly manufacturing processes amongst electronics makers, is planning to 'green the Apple Store San Francisco' this evening at 6:00pm local time. The organization has been on Apple's case for months, challenging the company and several other top electronics makers to use clean components in all of their products and to provide a free take-back program to reuse and recycle those products wherever they are sold. Greenpeace in August issued a report which gave the iPod maker a 2.7 out of 10 environmental-friendly rating, awarding it low scores in almost all criteria, including the use of toxic chemicals, recycling, and the quality of its take-back programs. During a press conference on Monday, representatives for the group said they plan to be outside this week's Macworld Expo in San Francisco, handing out flyers that present their views on Apple's environmental savviness —or lack there of —to conference attendees. Although Greenpeace had wished to be amongst the paid exhibitors at Macworld, their requests to do so were repeatedly denied by show organizer IDG (apparently under the influence of Apple). The blacklisting follows a controversial exhibition by the organization during the October Mac Expo in London, which drew several complaints from Apple and ultimately resulted the group being ejected from the show. Greenpeace's Rick Hind speaks to journalists during a press conference on Monday. 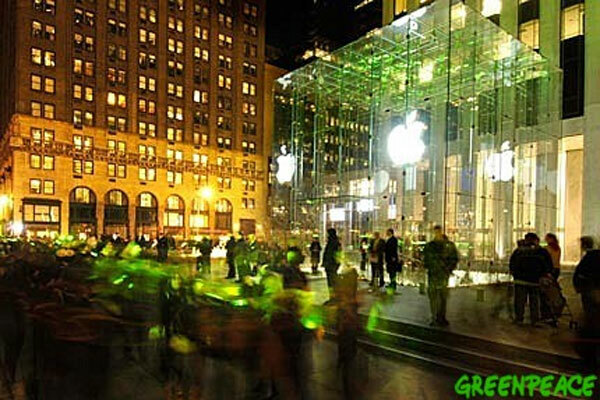 Unwilling to relent in its campaign, Greenpeace later 'greened' Apple's flagship store on Fifth Avenue New York City, shining green spotlights into the location's 32-foot glass cube in protest. Rick Hind, Legislative Director of Greenpeace USA's Toxics campaign, said the group is organizing a similar demonstration at 6:00pm pacific time today outside Apple's flagship store in San Francisco at 1 Stockton Street. "We used green floodlights on the New York City store —that was a symbolic screening," Hind said during Monday's press conference. He added that this evening's demonstration would "be different, and probably more dramatic." Greenpeace activists demonstrate with "green" light at the 5th Avenue Apple store in Manhattan. 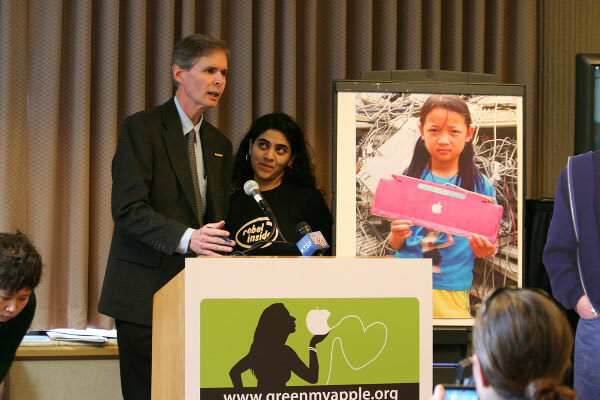 Greenpeace said its GreenMyApple.org website has been the highest trafficked website in the organization's history, attracting about half a million users thus far. Although Greenpeace admits placing Apple under more scrutiny than any other electronics manufacturer, it says it is doing so because the company is seen as the "signature innovative company" in today's market. If Apple does not lead the charge to go green, the organization argues, the rest of the industry will be reluctant to follow.